All mice are not created equal. Some are flimsy, some don’t track very well, and others require a dongle in one of your USB ports. Then there are those made of such cheap plastic that one swat of your cat’s tail and mousey commits suicide on your office floor. The hinge on my last mouse’s battery compartment fell apart and I got tired of holding the batteries in place with tape. 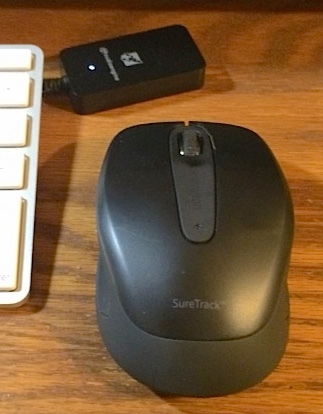 Kensington SureTrack Bluetooth Mouse has no such defects. I’ve been using it for two weeks. It feels substantial and not clumsy in the hand. It tracks smoothly, is very comfortable under my palm, plus it has a good scroll wheel and two buttons. The left button selects, and the right one brings up contextual menus. The screen display can be enlarged or reduced by holding down the Control key and pushing the scroll wheel up or down. 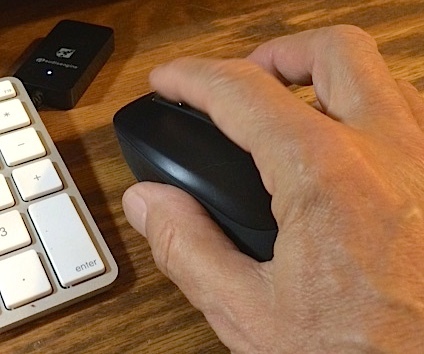 In addition, holding down the Shift key and pushing the scroll wheel shifts the screen right and left. Kensington claims the high definition laser sensor in this mouse enables it to track on any surface including glass. I’ve confirmed it works on glass. I don’t have a glass-topped anything but I tried it with a large shaving mirror. Tracks fine. It works perfectly on my wood desk. The mouse is powered by two AA batteries that are provided in the package. The SureTrack seems to go to sleep if it idles for a few minutes, but as soon as you move it, it instantly connects and is ready for action. I expect this napping is to prolong battery life.